Having a bigger kitchen makes a HUGE difference! Hello old friends, it’s been a while. Two months almost! I have been insanely occupied with my transition to San Francisco; packing up my old kitchen early to make the move easier (it wasn’t) has kept me away from cooking. But I’m all settled in my amazing place in the Sunset now. And to those who emailed me with suggestions, thanks! I’ll get through them, I promise. I have to say, eating out in SF is definitely addicting. But my knives are getting lonely. I think my butchering skills are pretty good. No, not really. I am not as fast but I definitely know what I’m doing. So here’s something I made for my friendship family by request– Chicken Ballotine. Super french = super awesome. It’s basically a de boned whole chicken stuffed and rolled. I prefer stuffing chicken breasts, but honestly after doing this, I can’t go back. First, for the jerk marinade, throw everything in a blender. Blend. Done. Heat a pan on low and melt about 2 tbsp of butter. Throw the onions in and brown until it gets that really nice deep brown color. Remember keep it on low, you don’t want it to burn. Toss occasionally. This is going to take a while, like 30 minutes. Heat olive oil in another pan, and throw in the 2 cloves worth of chopped garlic with spinach. Salt and pepper to taste. This takes only 3 minutes or so. When those are all done, let them cool. Be sure to check out his other works, he’s frankly the best! I just realized that what I made is basically what he made, with a Caribbean take on the seasoning. Follow his instruction with my marinaded chicken. I marinaded the chicken for about 30 minutes at room temp. If you follow his instructions, you should be good to go. Be brave, you can do this. I deglazed the pan with the marniade and added some white wine just to make a simple sauce. Once you sear the chicken, it goes into a 400F oven for about 40 minutes to finish cooking. Also, the farmers market in SF is amazing. Everything is fresh and cheap. And it’s right outside my work. 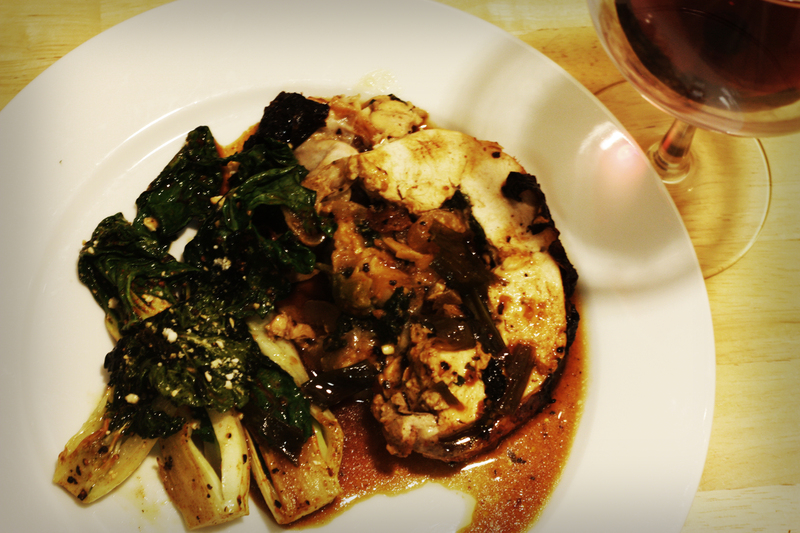 I grilled some bok choy, which really compliments the richness of the chicken and the stuffing. Topped it with feta, because I ran out of Gruyere ok? There’s more to come, don’t you all worry. 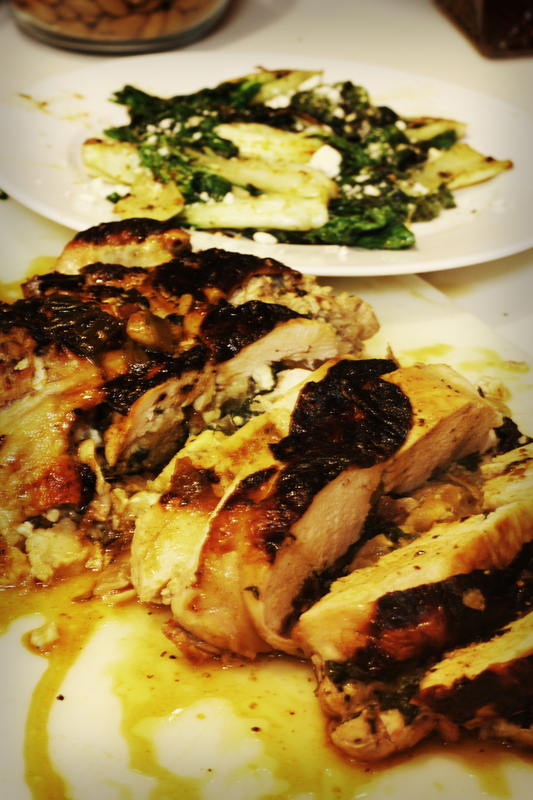 This entry was posted on August 15, 2012 by rrfoods in Chicken, Dinner and tagged ballottine, bok choy, carribean, cheese, chicken, Dinner, french, garlic, jerk, lunch, roast, spinach.